The average family of four generates approximately 2 to 4 gallons of water vapor each day through activities such as breathing, perspiration, showering, cooking and dishwashing. When moisture vapor remains in a colder/dryer attic, it can potentially condense damaging your roof deck and insulation. In cold weather climates, ice dams can form along your eave edge increasing the chance of a roof leak and damage to your gutters. Proper ventilated spaces reduce the Stack Effect by pushing warm, moist air out of the attic space. In addition to moisture build-up, proper ventilation also reduces heat build-up in your attic. Improper ventilation can lead to premature deterioration of your shingles and roof deck. 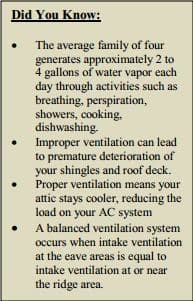 Proper ventilation means your attic stays cooler, reducing load on your air conditioning units. The less your AC unit works, the longer it will last, likely resulting in lower cooling bills. A balanced ventilation system is best. A balanced system is where intake ventilation at the eave areas is equaled at or near the ridge area. Minimum ventilation requirements are 1 sq. ft. unobstructed or net free area of ventilation for every 300 sq. ft. of attic space. The preferred ration is 1 sq. ft. of net free area of ventilation to every 150 feet of attic space. In order to qualify for a FHA loan, ventilation must meet the 1/150 rule. Calculators to help you plan the right amount of ventilation for your home and the ventilation system you select are available. There are different styles of ventilation systems available; many are 100% green, utilizing no electrical power. If the system is not balanced at the top or ridge area, or if there were gable end vents with ridge vents, without adequate soffit ventilation you may actually pull moisture into the home during a heavy rain or snow storm. The exception to the balance rule is at the soffit in passive systems. Since the air that enters at the soffit acts to push out moisture and warm air, having extra soffit ventilation will not create an off-balance system. Still have questions? For more information, please visit www.asphaltroofing.org to see ARMA’s MAT Releases, Case Studies and Videos.